Jennifer June doesn’t just collect boots—she collects the stories behind the boots and makes regular pilgrimages to meet their makers. In this interview, June explains the history of the cowboy boot and how Hollywood changed its appearance. She also gives us a rare look behind the scenes as she visits the shops of such important boot makers as Tex Robin and Alan Bell. June’s book “Cowboy Boots: The Art & Sole” was published in 2007. She can be contacted via her Facebook page. Cowboys have been wearing cowboy boots since the 1860s, but the true cowboy period in the United States really only lasted about 20 years. I think Justin Boots started production first in 1879. Later, Enid Justin went out on her own and formed the Nocona Boot Company 1925. Olsen-Stelzer is another old name in boots that grew out of the Justin family. They had catalogs early on and would do mail order to ranches and other places. It’s hard to pinpoint when a good idea gets started. It’s like, who invented the kitchen chair? Cowboy boots grew out of a need, and the origins lie in that function. The cowboys riding the trail up to the end of the railroad needed dependable footwear. Even today, nothing wears out on a cowboy boot very fast. You may lose a pull strap, but you’re not going to wear to the sole quick. The heel’s not going to come off. They’re built to last. For me, a cowboy boot should be a pull-on boot. It should have something that looks like a Western heel. Of course the heels and toes have changed. Some of the tops are two-piece tops, and some are one-piece. Sometimes the scallop is there and sometimes not. The cowboy boot has evolved over time, so its definition is broad. German boot makers who immigrated to America helped shape the look of the cowboy boot, but the aesthetics of the cowboy boot became more pronounced in the movies. The audience had to be able to tell from a distance that it was a cowboy boot, and there were symbols on the boot to identify the good guys from the bad guys. The cowboy boot, which began as a functional item, became associated with adventure and risk-taking. The factories got involved when cowboy boots became more of a fashion item. The movies made cowboy boots fashionable, as did the country-music industry and other cultural trends. Boot makers started playing around with the design and they made boots for different functions. For example, the short or pee wee boots won’t protect you from brush, but they’re easy to take on and off. They’re sometimes called banker’s boots because the banker wants different things from a boot than someone who’s clearing brush or chasing down cattle. Collectors Weekly: How many different boot heights are there? June: Traditionally, boots started off as protective footwear, so they came up pretty high. That makes for a boot that is heavier and harder to get on and off. Western boots were not quite as tall, maybe around 12 inches tall. There’s not much room on a pee wee boot for inlay and things like that, so a lot of the fancier boots will have 10- to 12-inch tops. Twelve to 14 inches is a normal boot height for a man. 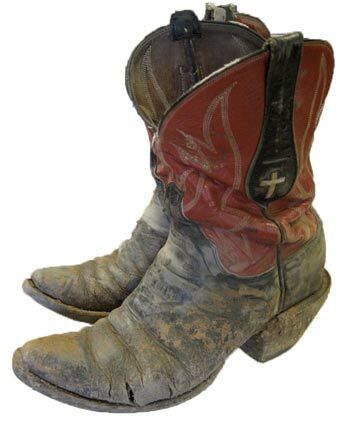 Eagle boots were a signature of Roy Rogers. Dale Evans wore butterflies. Cowboy boots follow American history. Making shorter tops was a way of saving leather during the World Wars. The shoe industry tried to adapt when it didn’t have leather, thread, and other things it always used. There was a golden age of cowboy boots after World War II. The labor was cheaper and the materials they used allowed for all sorts of creativity. You started getting layer upon layer of inlay and overlay. People really wanted to showcase the handmade stuff as other things were starting to be made in factories. So they became heavily styled. The boots got plainer in the ’60s and ’70s. The height of the heel has also changed over time. If it’s a higher heel boot, it’s either a fashion boot or for someone who’s in the saddle a lot and not doing a lot of walking. The lower boot, or walking heel, is more of a work boot type of thing. Collectors Weekly: What are some of the terms associated with boots? June: There’s the triad boot, which tends to go in and out of fashion. I found a photo on eBay of Ronald Reagan in a triad boot. Triad boots usually have the vamp that goes over your foot. It looks almost looks like a big wingtip. The side leather of the boot goes all the way down to the sole of the boot instead of stopping at the ankle. Sometimes it’s called a three-piece boot. That’s a unique style that’s popular in custom-made boots. The roper boot gets called a cowboy boot a lot. I’m on the fence about that. A roper boot tends to be a short-top boot, but not quite as low as a pee wee. It’s a pull-on work boot, so it’s got a low heel, a round toe, and a short top. Companies like Ariat and Tony Lama make contemporary roper boots. They tend to be really functional, but they can get fancy. They’re usually classified by what they’re worn for. So there’ll be a work roper boot and a dress version. People who wear cowboy boots for a living tend to give their boots a workout, as this pair of James Leddy boots shows. The toes have names, too. You measure the tip of the toe on a cowboy boot. If you order or describe a boot, you’ll talk about it that way. For example, you’ll refer to a 1-inch box toe or a quarter-inch box toe. A quarter-inch box toe is going to be a very narrow, pointed toe with a small squared-off edge. A lot of custom makers will talk about an X toe and a J toe. They’ll ascribe the letter to it because it’s not a universal standard, although it’s almost better to use descriptive words like small box toe or wide box toe. There’s also the French toe, which is a rather square toe that slopes downward. Those look like dress shoes when worn. It’s an elegant style. Another styling technique in vintage boots grew out of their popularity with country bands. When Buck Owens performed, he had a whole troop of people behind him. Their boots might have sparkles and all kinds of things on them to catch to eyes of the audience. The boots would often match the groovy outfits the musicians wore. Sometimes those boots had a cemented-on sole, which isn’t so familiar to people. The sole consisted of one layer of leather glued onto the boot rather than the more common stitched weld. That was okay, because the function of the boot was basically to be sparkly on stage. It wasn’t a work boot. Some performers liked the lighter feel of a boot with just the cement sole on it. That gives the boot a lighter look. There’s less distraction from the sparkles and the glamour. Collectors Weekly: Did the early cowboy boots also have different toe shapes? June: I haven’t handled a lot of antique boots. My understanding is that they were just round or square. In the general, the toe was much broader. Some of the boots were made before chrome-tanned leather. They used a vegetable-tanned leather, which didn’t last as long. A lot of the very early boots have turned to dust and blown away. Lasts are the forms that makers use to build a pair of boots. These were photographed at Bell Custom Boots in Abilene, Texas. A lot of 19th-century cowboys used the military footwear they’d worn in the Civil War. They were very simple leather boots. The standard colors were black and brown. Then chrome-tanned leathers were introduced, and that provided a little more color for inlay. Eventually the entire boot was made with more color. All sorts of exotic animal hides have been used for boots. A lot of the early cowboy boots were made with different cow leathers. In recent decades, you started getting alligator, anteater, crocodile, ostrich, and sea turtle. Again, those boots don’t have the same longevity because the skins are more delicate than traditional cowhide boots. Many boot factories started using these exotics to capitalize on the “Urban Cowboy” craze. People who wear a lot of cowboy boots often like exotic ones. The colors may be traditional, but the textures of the hides are really neat, especially something like a boot made from the hide of an anteater, which is an endangered species. There are new protections about making boots out of the hides of endangered species, so people are paying ridiculous prices for the existing inventory of vintage anteater boots. When an animal becomes protected, boots made from them can’t be sold anywhere, since it’s difficult to tell whether the boot is old or new. People look online or at estate sales to get around this restriction. Sometimes people will revamp boots made of exotic materials, which usually means making a smaller boot from a larger one. But that’s a tricky business because the skins are not always sturdy. Collectors Weekly: Was the use of exotic skins the result of fashion trends? June: They were in the sense that there’s a novelty to these things. You have these textures in handbags, too. There’s recently been more sea life used in cowboy boots—shark, stingray, eels. Each type of leather has a different texture and shine that takes colors and dyes differently. The eel boots have stripes. Stingray boots look a lot like Dorothy’s slippers in that they glisten and sparkle. Shark boots have a rough and sturdy quality to them. Ostrich boots were really expensive when they first came out, but now they’re pricier than cowhide boot. They’re not rare, just more expensive. 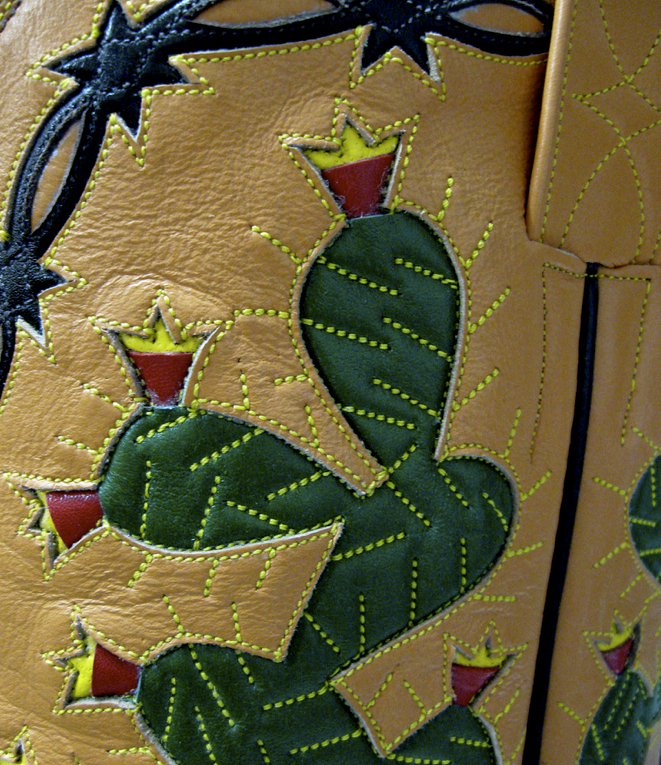 Texas has more custom boot makers and more boot wearers than any place in the United States. Cowboy boots follow fashion trends in the same way as jeans: Their popularity might go up or down, but they’re never quite out of style. White T-shirts, jeans, and cowboy boots are American fashion icons. The factory boots follow fashion trends more than custom boots. Right now they’re doing a little more with the grunge stuff. You’re seeing a lot of brand new boots with distressed leathers. By comparison, the cowboy boots of the ’70s were plainer, earthier. If you look at old cowboy boots, one of the common motifs was barbed wire. It represented prosperity when it was used on early boots. It had to do with branding your cattle and controlling a piece of land. Now barbed wire is all about rebellion and escape. So some of the messages conveyed by the same images have changed over time. Another example is flames, which turned into the chili-pepper motifs of the ’80s and ’90s, and then hot-rod motifs. Of course, even though the artwork and its meaning has changed, the materials and equipment used to make them are pretty much the same as they’ve always been. Collectors Weekly: How did boots change with the decline in popularity of Westerns after World War II? June: Well, a few years after World War II, you had cowboy mania on television with Gene Autry and Roy Rogers. In the ’50s, cowboys practiced a code of honor. They were upright American citizens and role models for children. My first pair of boots came out of that merchandising of the cowboy image, particularly the singing cowboys like Gene and Roy. 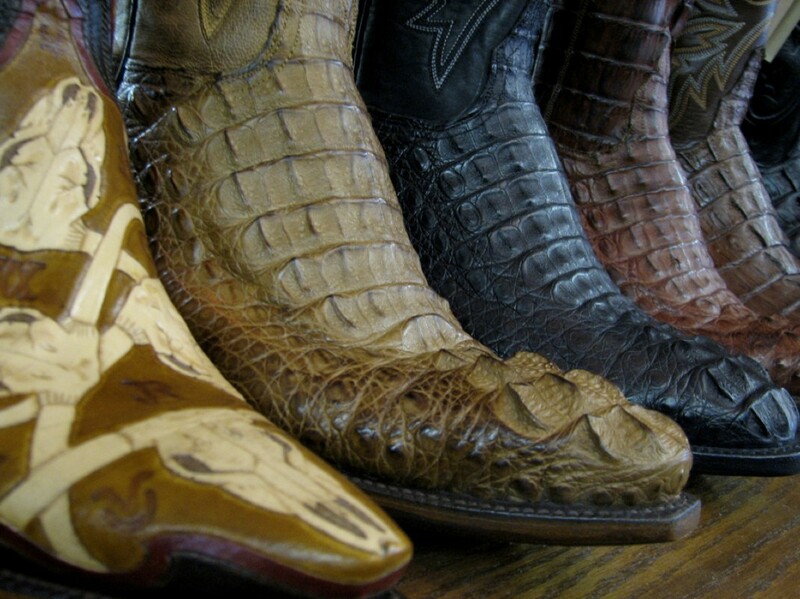 Lucchese is one of many makers who uses exotic skins such as alligator in its boots. These were on display at Allens Boots in Austin. I have a pair of pee wee boots that have a plastic sole. They were mass-produced, mass-marketed pieces of Western Americana made for kids. Children’s boots had wonderful, fun imagery on them—longhorns, a pony, a pistol, a horseshoe. By the ’80s, people were actively collecting cowboy boots. Tyler Beard and Evan Voyles pretty much bought every old boot in every Texas flea market and took them to L.A. to sell on Melrose Avenue and places like that. They were moving a lot of boots in the late ’80s and early ’90s. A lot of boots were also shipped to Japan. Tom Cruise wore a pair of vintage boots in “Top Gun,” and that probably helped make them popular. 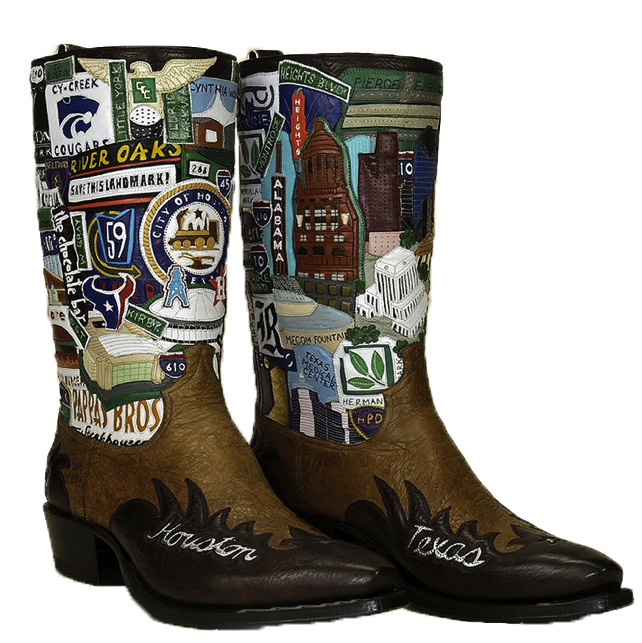 Collectors Weekly: Were certain states known for their cowboy boot? 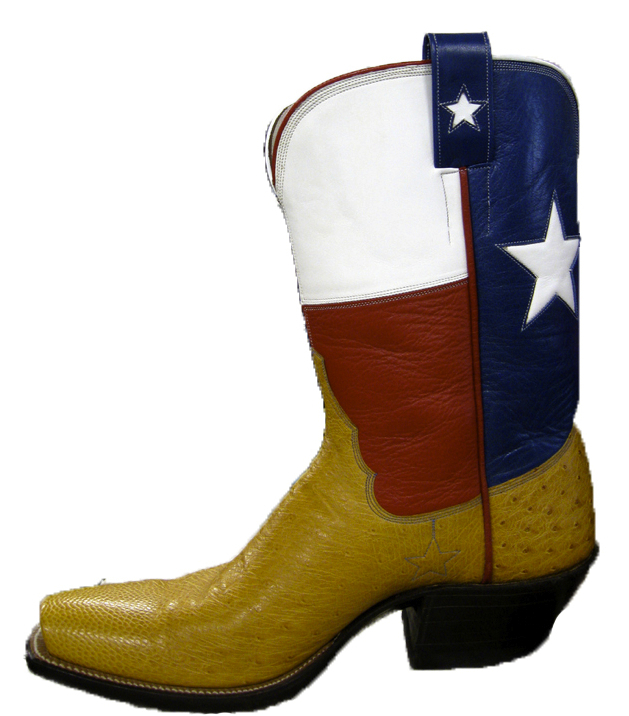 June: Texas is known for having more custom boot makers and more boot wearers than any place in the United States. I have maybe 250 names on my boot-maker list, and at least half of those are in Texas. Kansas claims the first cowboy boot and Oklahoma has a rich boot-making history but factories moved around. A lot of boots are still made in El Paso. The Acme Boot Company was in Tennessee. They made a lot of kids boots. Now a lot of boots are made in Asia, and they’ll probably soon be made in India. Boot makers tend to follow the cheap labor. 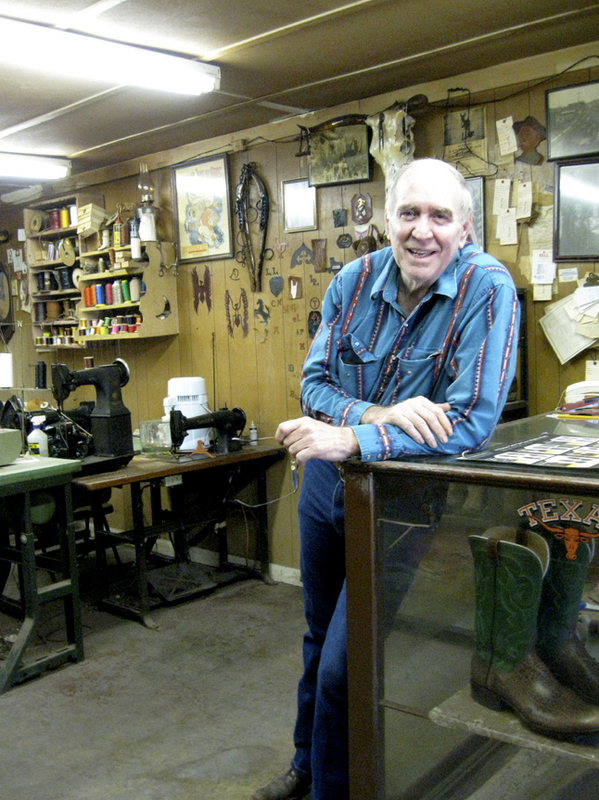 Tex Robin has been making cowboy boots in Coleman, Texas, since 1944. Many of the old custom boots weren’t labeled. That can make it tricky to identify a boot maker. You have become familiar with the individual styles and patterns of a boot maker. You can recognize the stitch pattern in some cases, the pull on the boot, or the tongue shape. Some boot makers stay loyal to a toe bug, which is the stitching on top of the toe, or they put a signature stitch on the side of the boot. That can sometimes be a clue as to who made the boot. It’s a lot easier now, though, with all the collectors on the Internet. There was a pair of boots on eBay recently with a stamp on the inside that the owner couldn’t read. I gave it a look and thought it might be a Tex Robin boot, except for the stitch. Then I recognized the stamp as Duck Menzies, who’s now in Temple, Texas. Then it all made sense because Duck had worked with Tex back in the day. So you’ll see these family trees of boot makers that can make it easier to figure out whose boot is whose. I’m not nearly as good at that as people like Mark Fletcher. I’m much better at living boot makers than deceased ones. Then there are all the boots that are made on the other side of the border in Mexico, no one knows by whom. If it’s pretty enough, it really doesn’t matter. Collectors Weekly: What are some of the other identifying marks of prominent designers? June: White piping up the sides of a boot is a central Texas thing, but it doesn’t tell you exactly who made the boot. And it’s tricky because there are a lot of mimics. For example, Willie Lusk in Lubbock, Texas, was a fairly well known boot maker and one of the few African American boot makers to have his own shop. He was credited with inventing the inverted flame stitch, which goes up from the bottom of the boot or from the top down. Pinup girls on cowboy boots, hidden under the pant leg, mimic the idea of private masculine space. A lot of makers have simply copied that, but what makes things even trickier is that not all Willie Lusk boots have that inverted flame stitch. There are subtleties to look for in a Willie Lusk boot, and some things were changed to meet a customer’s preferences. The shape of the tongue can also help identify the maker based on the stitch. For example, a James Leddy boot might have a little stitch on the side of the boot. I went to see Ray Price down at the Crystal Palace in Bakersfield, where Buck Owens used to play. There was a pair of Buck’s boots with a very pointed toe in a memorabilia display. You could see James Leddy’s signature stitched right in. Some makers have a signature stitch, but a lot of makers now use labels. Collectors Weekly: When did boots start to be seen as works of art? June: Probably in the late 1990s. That was at a time when everybody started thinking craft was art, but I don’t think every boot is a work of art. There are beautifully crafted cowboy boots that don’t carry any larger message or meaning beyond the craft that went into making them. There are some perfectly crappy factory boots that carry strong cultural messages. They can be seen as art, although they aren’t particularly well crafted. So I think the debate over what is art and what is craft is just getting going on some of this stuff. Collectors Weekly: What cultural messages should a boot deliver? June: Well, let’s start with what they shouldn’t do. Personally, I’m on a campaign to get flamingos off of boots. Some people want to put anything and everything on a cowboy boot, but the flamingo has no relevance. It’s a bumper-sticker boot; you can put anything on a bumper sticker. On the other hand, stitching something like a bucking bronco on a cowboy boot makes it larger than the sum of its parts. 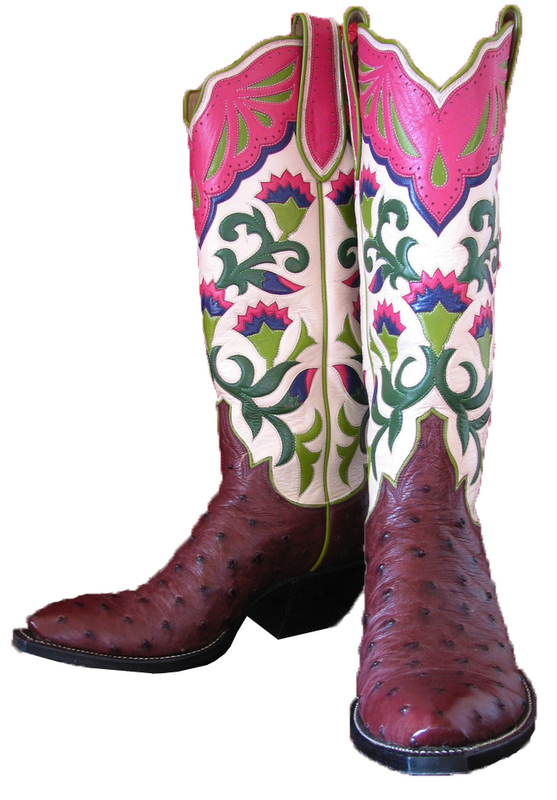 These colorful gems were created by Wheeler Boot Company of Houston, Texas. I find that motifs on boots often coincide with aspects of the American Dream. Concepts like luck and chance work really well on a boot. These ideas might be represented by something like playing cards. There are some great vintage boots with luck and chance symbols. They might also feature dice, four-leaf clovers, horseshoes, playing cards, gold coins, and other things related to taking risks and hitting it big. Tres Outlaw did a Vegas boot all about the promise of hitting it rich. A big part of the American Dream is starting with nothing and getting a big payoff for either taking a risk or a chance. Cowboy boots also represent wide-open spaces well, along with things like butterflies and flowers. These designs are in tune with some of the landscapes of the West. Personal identity is represented in the initials and the brands on boots. On older boots you might also see symbols prosperity, represented by longhorn cattle or oil wells. Now you might see a corporate logo or a hundred-dollar bill on boots. Some people use exotic leathers and expensive hides to show they’ve arrived. Skulls, skeletons, and Day of the Dead images are also popular and interesting. The Skeleton is usually a frightening image, but there’s also the idea of death as a new frontier, the unknown. You’ve also got prickly cacti and scary things like scorpions and snakes. That kind of stuff is fun. There’s also a lot of patriotic imagery—Texas flags, American flags, eagles, the stars and stripes. The earliest flag boots were made for display only because there were laws against wearing flags. When the laws loosened up, a lot of Texas flags went on boots. Collectors Weekly: Can you explain the custom boot-making process? June: It varies shop from shop to shop. There are a lot of one-person shops where they do everything. They measure your foot, pick out the leather, stitch the top, and build the bottoms. Some of the larger shops have specialists in each area, so there’s someone who does top-stitching all day long or builds the bottom of the boot. Sometimes the owner participates in one of those tasks. A boot without the adventure is not a complete boot. Some people like the relationship you can establish with the owner of a one-person shop, but there’s much to be said for someone who stitches all day and gets very good at his craft. With a team effort you also get your boot a lot faster. Even with factory-made boots, a lot of the handwork is unavoidable. 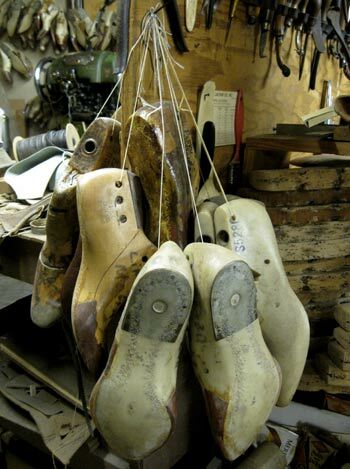 Many parts of a boot are handmade, even in a big factory like Lucchese. Collectors Weekly: Why did you get so interested in cowboy boots? June: I think cowboy boots should take their rightful place in people’s hearts and minds as an American art form. A boot with hemline stitching can carry cultural messages just like sculpture or paintings. Cowboy boots are unappreciated and overlooked in that way. That’s why I wrote I wrote “Cowboy Boots: The Art & Sole.” I wanted to talk about what boots say about the wearer, and what they tell us about the American Dream. 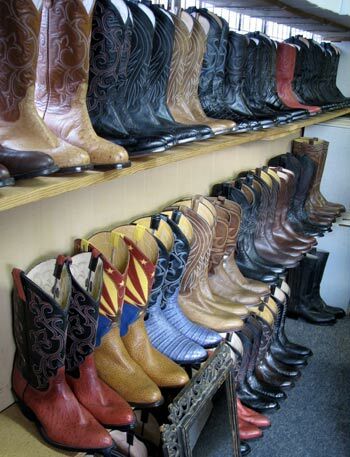 Custom boots on display at Espinoza Boot Maker in Phoenix, Arizona. I got into boots the way a lot of people do: I found a pair I loved. I found them at a vintage clothing sale around 1997. They were actually little boy’s boots, but my feet are so small that they fit. It was a pair from the 1950s with a squared-off toe and a little inlay. I wear them all the time. Maybe six months later, I came across Tyler Beard’s “The Cowboy Boot Book.” That’s when I learned about custom-made cowboy boots. For me that book was like finding a treasure map. I opened it up, pointed at a page, and said: “I want to go there. I want to meet custom boot maker Jack Reed. I want to do these things and know these people.” That’s where it took off. I started my webpage a little later because I didn’t have anyone to talk to about cowboy boots. I just started putting stuff online. Back then the Internet was a much smaller place, but I did find some people who were into boots. We’d talk about the antique pictures I’d found on my field trips. It’s fun. There’s a yearly roundup of boot makers in Wichita Falls, Texas. Sometimes I’ll meet the makers there, but I also like to visit them in their shops. I try to take pictures, get people’s personal histories, and find out what they think about boots. I try to learn about the personality of the maker, the work they do, and the shop that they keep. The makers and the customers are very interesting people. I have a Flickr page where I post a lot of pictures from my field trips. Collectors Weekly: Do you buy a lot of cowboy boots? June: I don’t buy boots as much as I acquire them. I have plenty because I used to buy them to wear, but once you have a custom pair of boots made for your foot, it’s hard to go back to wearing vintage boots. Vintage boots wear out, so you have to wear them sparingly. And if the fit isn’t very good, it’s even harder on a boot. Many boot factories started using exotic leathers to capitalize on the “Urban Cowboy” craze. My collecting has changed. I used to go for pretty boots. Now I go for something that’s a little more unusual or something with a really good wear pattern. I recently got a pair just because I liked the stitching. Some people collect boots because they’re beautiful objects. You can buy a vintage boot and have a custom maker add parts, like the pull-tabs or a certain kind of toe. You might even have the entire boot remade by a custom maker. I’ve got about 15 pairs now. I’m less of a collector than I used to be, and much less so than the people who visit my page. Some of them have boot rooms with bookcases on all four walls displaying at least 300 pairs of boots. I also have a few pairs of custom boots that I wear over and over. I tend to spend my money on airplane tickets rather than boots. So I visit a lot more boot shops, take the photos as souvenirs, and have a good time with the boot makers. But I don’t have a lot of boots made. Collectors Weekly: Do you have a favorite pair of vintage boots? June: Yes, a pair of Trujillo brothers boots. They’re great boots, and they have a history behind them. Really special boots tend to get passed down, not so much through families, but through the community of collectors. Tex Robin is famous for its stitching, especially of cactus and barbed wire. It’s not only the history of the maker that’s important, but who owned the boot. The boots you see in museums may be beautiful, but odds are somebody famous wore them. Maybe it was Gene Autry’s boot or President Reagan’s. Usually there’s something remarkable about the boot, the materials, or its place and time in American history. People collect boots for all kinds of reasons. If you collect boots just to wear them, then maybe you’d be into the ’80s. A lot of those boots are still completely wearable. More serious collectors tend to collect boots by custom makers. They’ll go for Willie Lusk boots or some of the smaller Texas makers. I know of someone who just collects boots with eagles stitched in inlays. Eagles in general were a very popular design, especially in the late ’40s through the ’50s. It was a very patriotic and proud time for America, but it was also the signature boot of Roy Rogers. Dale Evans wore butterflies. Collectors Weekly: What are people collecting now? June: The amount of design work and the number of boots from a particular maker that are still around influences rarity and collectability. Boots from smaller custom shops are more sought after because they didn’t make as many as Justin or Acme. Paul Bond and Ray Jones were very productive custom makers, but a lot of those boots were destroyed through wear. 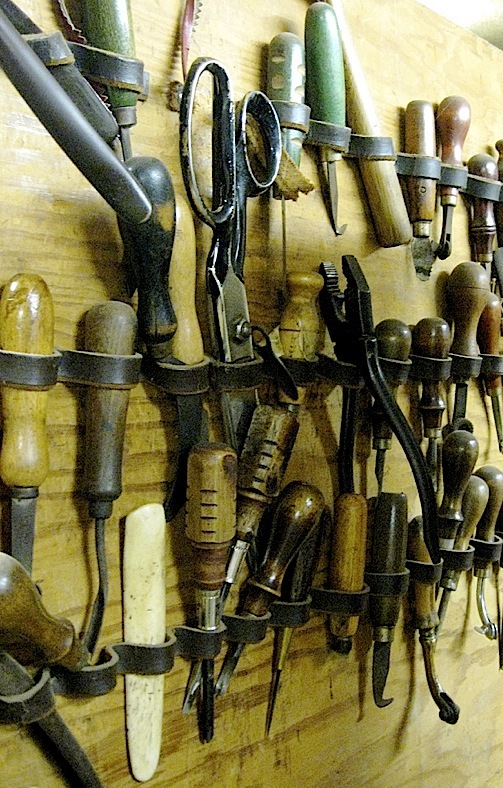 A wall of hand tools at Bell Custom Made Boots in Abilene. A lot of families hold on to boots through the generations. That makes them rare. The materials are also a factor. Many of the more flamboyant boots weren’t terribly well made, but they’re so showbiz that they’re attractive to collectors. Right now, there’s a lot of interest in the beautifully designed and heavily stitched boots with inlays and colors. People are also going after particular makers. Sometimes those boots aren’t even in pairs. I know of cases in which people have bought one boot just because it was so beautiful. You don’t always have to display boots in pairs. You can just focus on the art of one boot. There also seems to be a lot of interest in boots decorated with skeletons and skulls or pinup girls. When I was writing my book, I was surprised by that. One of the chapters, “Pretty Girls and Loose Women,” wasn’t even in my original outline, but it was hard to ignore as I did my research. These designs were usually at the boot top, hidden under a pant leg or something like that. It was kind like the pinup girls on a garage wall or the mechanic’s tattoo under his sleeve; the boot top was mimicking the idea of private masculine space. That was a surprising new area for boots to me. Finally, the idea of collecting a few kids’ boots really appeals to me. There’s something about the simplicity of the design and the tremendous wear these boots get that I just love. Cowboy boots, particularly ones made for kids, take on a better shape when they’re worn. I see new boots and always wonder what they’ll look like two weeks later after they start taking on the shape of the foot. That’s where the adventure comes in: A boot without the adventure is not a complete boot. Collectors Weekly: What advice do you have for someone who’s new to collecting cowboy boots? June: Try to find a lot of vintage boots in one place so that you can look at them and hold them, even if you’re not buying. The High Noon show in Arizona or even some of the big flea markets are good places to go. I think there are a few folks at the Rose Bowl selling boots. When you see a lot of boots together in one place, you can get an idea about what you consider acceptable levels of condition and wear. The man himself, Alan Bell, at his shop in Abilene. It’s good to get an idea of some of the makers, the different sizes of boots, and things like that, just to build your expertise. Check to make sure the leather doesn’t look too dry. And get online: My site has a lot of vintage collectors moving through it, and there are links to other forums where collectors go to pass information back and forth. Also, don’t rely solely on eBay. Once you know what you like, eBay is a great place to get that one pair that shows up in an estate sale where you least expect it. But also develop relationships with dealers because they’ll treat you right price-wise, and they’re magnets for boots. A lot of the eBay dealers are regular boot dealers. You can have frank discussions about the condition of the boots and also have a better chance of collecting some sort of story about the boots you are about to buy, which makes it fun. Write the story down and stick it in the boot. That’s what I do. Collectors Weekly: Do all of your boots have a story? June: Not yet, but many do. I have a pair that I call my all-star boots. They were a gift from a bunch of boot makers at the roundup a few years back. Each boot maker worked on a different part of the boot. The boots were passed from shop to shop and were given to me when I went to Wichita Falls. It was a complete surprise. That’s a very special pair of boots. Collecting cowboy boots is fun. There’s a big community of people out there that get excited about cowboy boots and are happy to share information. A lot of the makers are still making boots, and the ones that aren’t? Let’s say you find a Ray Jones boot. Well, Ray Jones is gone, but Pablo Jass worked for Ray Jones for years, and he’s still making boots in Lampasas. So you can find out a lot about Ray Jones from Pablo or from other collectors, and that makes for a richer collecting experience. So go for the stories, not just the labels. a great site I have been collecting boots for a long time, I make planters and anything that my creative mind, there stories behind all my boots, I have several pair that I wear..but alot are on display for sale…. What happened to Olsen Stelzer Boot Company? Are there boot makers still making boots for another company? Is Olsen or Stelzer still in business? Would appreciate some information if it is out there. Thank You. I was looking for a pair of Flamethrowers by Tony Lama 14. Nobody seems to know what Im talking about. Do you. I just puchased a beautiful pair of cowgirl boots at Buffalo Exchange in Tucson. The background is black leather with an intricate design of of cowgirl on a horse tossing a lariat. The design is in a buff colored contrast leather. Lots of stitching thrown in. Toes are seemingly a stamped latigo as are the boot loops. The trademark inside the boots is “BM” and the style is H303 s(could be a K, but looks like an H to me). The boots have a registration number in them which leads me to believe that they are hand lasted. The sole has some tiny hearts in it. Love the boots…would like to know more about them. I’ve never heard of a BM bootmaker around here. Who knows where they were made. They definitely have the quality of hand made boots s(ie Stewart Boots in Tucson). Wasn’t successful in tracking down the BM trademark online. Any ideas out there???? I have a pair of women’s tall navy blue Larry Mahan boots. Lavender inlay up the sides. I cherish them. I believe they may have been made by Justin. I have had them for at least 20+ years and they are starting to tear on one side since my feet have widened over the years. I would love to find another pair. Any thought as to how I might find them and also any ideas as to who I may be able to send my old ones to for repair? I love your article! My son has started collecting boots. I was wondering if you have ever bought shoes from J Adler? I wanted to buy him a nice pair for graduation. Go to Gypsy Hart Cowgirl out of Georgetown, Texas for a great pair of Pre-Loved/Vintage Boots… The folks are wonderful and the service can not be beat. The boots are priced very good and the boots are in great shape some are almost new… facebook them at gypsyhartcowgirl for info…. The JS boots were made by the one and only Charley Dunn, a custom boot maker from the “old” Lucchese tribe. His shop was in Austin, Texas. I am sure he was buried on “Boot Hill” with the highest of honors. He was the best. who makes the best boots well that is just a matter of opinion, lucchese makes a good boot but stay with the classics the others are just boots the stitching on the toes of the boots leave much to be desired t.o stanley made a good boot. blucher makes a great boot but unless you are young you will never get your order filled . smitty is a one man operation and he has many distractions.his top stitching is among the best. your best boot buy is to go on ebay and get an older boot but be sure you know your size and it is a good idea to know something about boots before you make your purchase this is one old man s opinion. My husband has an old pair of ostrich belly boots that have a stitched J on the inner side of the boot and a stitched S on the outer side of the boot. Can you tell me who made these boots? #14 Judi. Your husband’s boots sound like T.O.Stanley boots. I have five pairs of his boots and one of them are ostrich. They are my favorite to wear out of all my boots and I have many. Great site – I enjoyed visiting it. I am from England and love to collect USA made cowboy boots. Just got my hands on a great pair of leopard pattern stingray leather boots. I have a pair of boots with a logo on the bottom of the outside , braiding up the side. How can I find out what type and how old they are? I bought a pair of boots at an antique shop in Gruene, TX. They have no markings inside, but there is a stamp on sole that it a stylized barb wire within some scroll. Can someone tell me the maker? Just located this site while researching a pair of boots my father gave me years ago. They were made by Willie Lusk around 1965. My father was a corporate pilot and his boss only wore Lusk boots. While in Lubbock for business, Dad’s boss wanted several new pairs of boots. He also offered to buy Dad a pair, but my father was not a cowboy boot kind of guy. So, his boss wanted to know my size. He had my father call home…at about two in the morning…to find out my size. Mom told him, but later had to trace the outline of my foot and send it to Lubbock. About four months later, a package arrives…the boots. They are black with golden stitching and my “S” initial at the top front. I’ve seldom worn them and they are in great shape…and still very comfortable today 50+ years later. I have a pair of cowboy boots my Mom bought in Texas. They are made in the USA and are stamped on the inside with a letter A with a circle around it. Looks like there is a style number last couple numbers 18009259712. Do you know the maker of this boot? Brenda (#12) that’s actually a T and an S, not J and S. That is the mark of one of the most highly regarded makers, T.O. Stanley. Maureen, (21) those are Acme’s. “ ” And in those days you also got shoulder pads, for free.